The American Heart Association San Diego division kicked off the 10th anniversary of the American Heart Association’s Go Red For Women movement on Jan. 31, 2013, with a Go Red For Women Building Lighting Ceremony at the University of California, San Diego Sulpizio Cardiovascular Center. More than 100 people attended the event to voice their support and encourage women to make it their mission to be heart healthy. It’s time for women to stand together in the fight for their lives. Because heart disease is their No. 1 killer, affecting more women than men. Because it’s more deadly than all forms of cancer combined. Because women we love are dying and many more are affected every day. But the strength of mothers, sisters, daughters and friends fighting side by side is more powerful than any killer. Newborns needing specialized medical attention -- whether or not it is cardiac-related -- receive tender-loving care at Tri-City Medical Center’s Neonatal Intensive Care Unit (NICU), the only Level III NICU in North County. The hospital’s NICU offers comprehensive services not available elsewhere in San Diego County and keeps families together using the latest technology. Tri-City Medical Center is No. 1 in San Diego County -- and among the top 1 percent nationally -- for reducing readmissions for heart attack and heart failure. Women have been fighting heart disease individually and together as part of the Go Red For Women movement since 2004. As we begin our 10th year, more than 627,000 lives have been saved. But the fight is far from over. Tri-City Medical Center is keeping pace with the staggering developments in robotic surgery, and just last month it became the first hospital in the United States to own two Mazor Robotics Renaissance Surgical Systems for spine surgery. And the hospital continues to be the only facility in San Diego County to offer robotic spine surgery using this unique system. 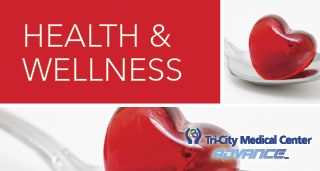 The Tri-City Wellness Center has all the trappings of a first-class gym — a lap pool, a warm-water therapy pool and whirlpool, exercise equipment (treadmills, stair steppers, elliptical trainers, bikes), showers, Jacuzzi, a cushioned walk/jog indoor track and steam rooms. Caleb Peltier was just three days old when he arrived in the emergency room at Tri-City Medical Center in September 2010. He was barely breathing and his young mother feared her newborn son, seemingly healthy at birth, would not leave the Oceanside hospital to join his family at their home in Vista. Tri-City Medical Center is certified as a STEMI (heart attack) Receiving Center because the hospital meets aggressive treatment standards that produce good outcomes. The emergency room team’s job is to get the patient from the ER to the cardiovascular catheterization lab for angioplasty as quick as possible. Heart disease is the No. 1 killer of American women. Know the risk factors for heart disease that you can control, and make heart-healthy choices to reduce those risks. The number of Americans projected to gain insurance from the U.S. health care law is eroding by at least 5 million people as the Obama administration struggles to implement the $1.3 trillion overhaul amid Republican opposition. Tri-City Medical Center is a Gold Seal-approved, full-service, acute-care hospital with two advanced clinical institutes and physicians practicing in 60 specialties. The hospital, a leader in robotics and minimally invasive technologies, has served the community for more than a half-century. It is administered by the Tri-City Health care District, which includes parts or all of Oceanside, Vista, Carlsbad and San Marcos. WASHINGTON — Eager to buy time and avoid economic pain, President Barack Obama urged Congress on Tuesday to pass targeted short-term spending cuts and higher taxes as a way to put off sweeping, automatic cuts that would slice deeply into military and domestic programs starting March 1. WASHINGTON — Just 16 percent of eligible workers took time off under the Family and Medical Leave Act last year to recover from an illness, care for a new child or tend to a sick relative, according to a government report released on the law's 20th anniversary Tuesday. Most employers said the absences did not hamper productivity or profitability. Join us as we explore innovations in health care, from company wellness programs to what’s online.